Driver For The Dead Contest | Radical Studios, Inc.Radical Studios, Inc.
To celebrate the release of the Driver for the Dead miniseries in trade paperback, Radical is thrilled to announce the launch of a new contest. Starting this Wednesday, September 14, you could be one of eleven lucky winners to walk away with a Driver for the Dead prize bundle! Entrants may submit one tweet and status per day each day of the contest, and winners will be selected at random after the contest’s conclusion on Wednesday, September 21, 2011. 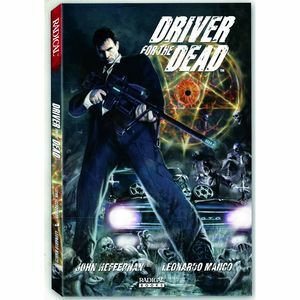 Ten winners will receive a copy of the new Driver for the Dead trade paperback and limited edition lithograph signed by the author, John Heffernan, while a single grand prize winner will receive a signed copy of the Driver for the Dead trade paperback as well as the opportunity to talk to John Heffernan over Skype. There are only 10 lithos printed and numbered, so this is a very limited print run. Don’t miss your chance to win a great read, a fantastic art piece, or even a conversation with one of the best writers in the business- enter today! 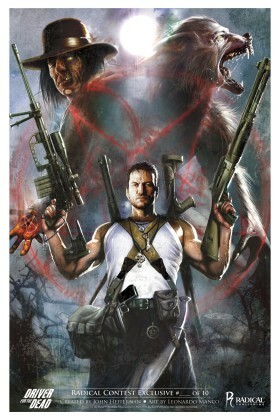 I think radical has some of the BEST comics I have ever read! This one will definitely not let me down. Pingback: R News, Episode 16: Interview with John Heffernan | Radical Studios, Inc.